Don’t go to a house of horrors twice. You learn all the false walls and where the skeletons will lunge at you. Similarly, spend enough time with Alien Isolation and you can spot the strings. This isn’t so much a criticism of the game as it is a call for houses of horrors to employ aliens because, for all that I’ve learned about how Alien Isolation works, it still scares the crap out of me. 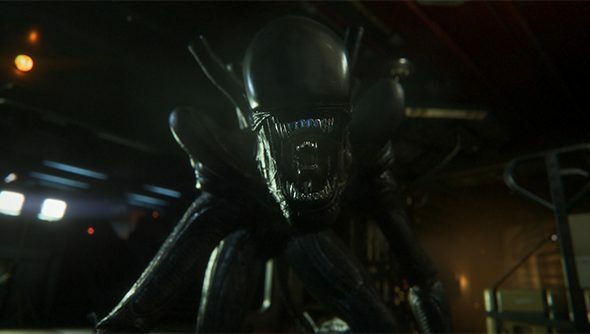 Just before Gamescom, Sega left me in a dark room with a four hour chunk of Creative Assembly’s first-person survival horror, the game that sees you step into the boots of Amanda Ripley, daughter of Ellen Ripley, as she tries to escape the alien that’s found its way onto Sevastapol, a station in deep space. It left me shaken, sweating, and full of questions. Luckily, the game’s senior designer, Gary Napper, was on hand. 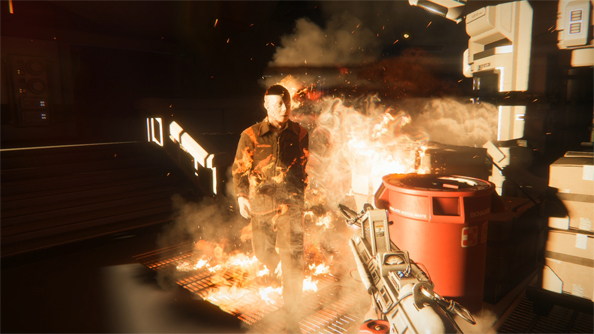 “We knew straight away that if we couldn’t build a believable, terrifying alien then we didn’t have a game,” Napper explained. “We couldn’t have the alien bust out of the same wall and run down a corridor and start a patrol pattern because as soon as you start learning those routes you have more information than the creature and you stop being scared of it. 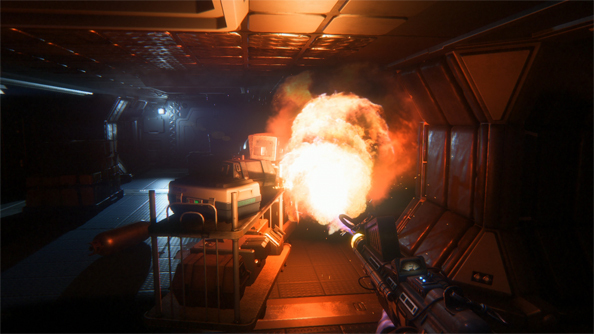 This is the second time I’ve had a sit down with Alien Isolation and what I find frightening has changed. The first time I’d jump from my chair when the alien would suddenly spring at me from a dark corner, or be waiting for me as a door slid open. I don’t jump anymore. The fear is now a constant, crawling sickness in my stomach about the task ahead. One section of the demo takes place in the Sevastapol’s med labs. You’re trying to get to the synth labs to the north, working your way through cluttered corridors, abandoned, bloodspattered offices, and uninviting air ducts. At one point I had to put down the controller because my hands were shaking. The entire time I played that area, more than an hour, I had the motion tracker blipping away, telling me the alien was mere meters away waiting for me to make too loud a noise. I didn’t want to move from my hiding place under the table because I knew that any noise could get me killed and that would send me right back to the last save point and I’d have to do the whole thing again. But nor could I stay sat where I was because it’s not safe to sit still: the alien will find you. After having the alien stalk me so many times I wanted to know more about how it hunted. “The alien is based on a set of senses – it can hear, see things, and react to light and movement,” Napper said. “It will change its behaviour set depending on what it’s witnessed, whether it’s been damaged by fire, or has seen you hide under things. After the alien has encountered you a couple of times it might spot you a lot more easily because its senses are heightened. It knows what it’s looking for. At one point I was in one of the medlab offices, hiding from a group of mercenaries patrolling the corridors. Motion tracker in hand, I watched as three dots closed in on my position. Then, from the side of the tracker’s screen a fourth dot started to race towards the mercenaries. I heard them scream as the alien caught one of them. The other two merc dots raced off in different directions, one of them came barreling into the storage room and hid, whimpering behind a stack of crates, not noticing that I was already in there under a table. The alien, having killed the other escaping merc, then came to our room. I edged back under the table, as far from it as I could, praying it would only find her and leave me be. It didn’t take the alien long to detect the source of the crying but, then, after killing her, it turned and found me, too. The whole sequence was both like something straight out of an Alien movie and completely unscripted. It didn’t leave me frustrated – it didn’t seem unfair because it was consistent with how the AI had behaved up until that point – but it also felt like my death was entirely down to luck. I was unlucky that the merc picked that room to hide in. It was unlucky that the alien heard her crying. And it was unlucky that it had found me after finding her. Time and again, death after death, I found that I ended up in a corner through my own actions but also the conflicting actions of the different AIs playing off each other. I’d be in one part of a level but the alien and the mercs would approach me while interacting with each other. That’s why I began to fear the medlab. I knew its layout well, I knew all the entities at play, I knew where my objectives were but I could predict nothing. If this is true of all of Alien Isolation I’m going to be a nervous wreck by the end of it.